Six ordinary strangers awaken to find themselves in a seemingly endless maze of interlocking cubical chambers armed with lethal booby traps. Without food or water, they have only a few days to live. None of them knows how or why they've been imprisoned, but soon discover that each possesses a skill that could contribute to their escape. As they work together to extricate themselves from their claustrophobic cell, one thing becomes painfully clear -- unless they learn to cooperate to solve the secrets of this deadly trap, none of them has very long to live. Cube is a long time favorite of mine. Every since I originally saw it on Sci-Fi Channel years ago. I ordered it immediately when I found out it was released on DVD. This was before the Signature Series came out... But it didn't take me long to upgrade it. And for some strange reason... I was never able to part with the original release of this movie.. Cube movie definitely has it's share of gore in it... but it has much more then that... shows what people are capable of in the name of survival. And you better believe... some of it is not pretty. Another thing I really enjoyed in this movie... it was my first introduction to Nicole DeBoer... an actress I quickly became a fan of. With 'Salem’s Lot', a blood-curdling shocker based on the novel by Stephen King, director Tobe Hooper ('Poltergeist') sends the time-honored vampire legend soaring on bat wings into the modern era. Sinister events bring together a writer (David Soul) fascinated with an old hilltop house, a suave antiques dealer (James Mason) whose expertise goes beyond bric-a-brac and the dealer’s mysterious, pale-skinned "partner" (Reggie Nalder). The solid supporting cast of vampire victims and fighters includes Bonnie Bedelia, Lew Ayres, Elisha Cook, Ed Flanders, George Dzundza, Lance Kerwin, Geoffrey Lewis and Marie Windsor. It’s hard to keep the undead down. And so easy to be scared in 'Salem’s Lot'. I have loved this one since the first time I saw it back in my teen years. Of course this is an adaptation from the book that Stephen King wrote. Who of course is my favorite horror writer. This is one of the few movies that scared me as a kid. A couple of my favorite spooky parts in this movie is ..
1. The kid vampire scratching at his friends window.... pleading with him to let him is. Of course this movie does not scare me any longer... but then again... I haven't seen any horror movie that has scared me in a very long time. Not to say the movie is any more or less scary... it just don't have the same effect it once did. Needless to say... this is one I would always highly recommend to any horror fan... and an absolute must see for any fan of vampire movies. Now... please lets see a DVD release of Return to Salem's Lot! It has been so long since I seen the sequel I can't remember anything other then it's existence. Blonde, bouncy Buffy (KRISTY SWANSON) is your typical high school cheerleader - her goal is to "marry Christian Slater and die" and nothing gets in her way when it's time to shop. But all that changes when a strange man (DONALD SUTHERLAND) informs her she's been chosen by fate to kill vampires. With the help of a romantic rebel (LUKE PERRY), Buffy is soon spending school nights protecting L.A. from Lothos, the Vampire King (RUTGER HAUER), his sidekick, Lefty (PAUL REUBENS), and their determined gang of bloodsuckers. It's everything you'd expect from a teen queen in the Valley. Thought it was about time for me to slip in a Comedy-Horror. I enjoy a good comedy horror now and then. I know a lot of people that prefer the TV Series to this movie... and I agree... I do enjoy the series more... but I do still enjoy the movie as well. The thing is... with this one... I do definitely enjoy it and find myself coming back to it multiple times. But I have no idea why I enjoy watching this movie as much as I do. It isn't particularly that funny... but all the same I still really get a kick out of it. This is one of my favorite '80s horror. Of course I am a big fan of Stephen King anyway. I found the all kids cult to be an interesting storyline... and some of the killings, especially in the beginning was done well. Over-all a really enjoyable movie... even if some of the acting could have been better. From modern horror master Wes Craven ('Scream', 'Scream 2') comes a timeless shocker that remains the standard bearer for terror. Nancy (Heather Langenkamp) is having grisly nightmares. Something monstrous wants to kill her. Meanwhile, her high-school friends, who are having the very same dream, are being slaughtered in their sleep by the hideous fiend of their shared nightmare. When the police ignore her explanation, she herself must confront the killer in his shadowy realm. Featuring John Saxon ('Enter The Dragon') and Johnny Depp in his first starring role and mind-bending special effects, this horror classic gave birth to one of the most infamous undead villains in cinematic history. Reportedly naming Freddy Krueger after a kid who had bullied him in school, writer-director Craven hatches a shock-fest from hell that "goes straight to the heart of terror" ('Seattle Times'). Every since I first saw this movie (24 years ago!) it has been one of my all time favorite horror movies. I remember being a 15 year olf kid... this movie scaring the crap out of me. And loving every second of it. Of course the movie don't scare me any longer... but I still love it. Since buying this dvd (The Nightmare on Elm Street Complete Collection of course) back in 1999 I must have watched this movie at least a dozen times. It is one I seem to never get tired of. Hopefully I will still get in at least 2 or 3 for today... but unfortunately real life getting in the way of my horror today! 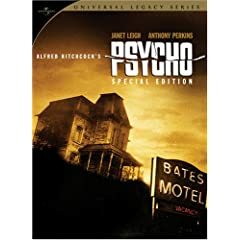 Well as you just rated Nightmare better than Psycho, I think you need a rest! I am hoping to be able to pop in a movie here soon though. Horror takes a detour deep into the woods in this terrifying cross between 'Scream' and 'Tales From The Crypt', starring Christine Taylor ('Dodgeball') and Ron Livingston ('Office Space'). This is another one I never seen before. Basically just bought it because I really like Anthology horrors... and this one sounded interesting. And I am so happy that I did! I think this movie will rank up there with my top favorite anthology horrors! Not only was all 3 stories suspenseful with great atmosphere... the wrap around story (where anthologies usually loose me) was a really good story in it's own right. I also liked the fact that Glenn Quinn (Roseanne, Angel) was in the last story of the movie. The only thing that I could consider a downfall in this movie would have to be the fact that the first 2 stories are tellings of very well known urban legends... so you fairly quickly know what to expect. But the thing is... these stories are done so well you still enjoy every minute of it. This very well could be my favorite movie of this year's marathon. It will be tough to beat anyway! Sam and his older brother Michael are all-American teens with all-American interests. But after they move with their mother to peaceful Santa Carla, California, things mysteriously begin to change. Michael's not himself lately. And Mom's not going to like what he's turning into. Definitely one of my favorite Vampire movies... one I have seen countless times that I never tire of. This movie is the first thing I ever seen Keifer Sutherland in... and I think he did an awesome job in it. I also think Jason Patric did a great job as Michael. and I definitely couldn't help but to enjoy the Old Fart (Grandpa)... I just get such a kick out of him and all the stuffed animals he gave to Sam. Definitely one I would highly recommend to any horror fan... especially vampire fans. Though I do believe most all horror fans probably seen this one by now! Risking everything in search of the ultimate rush is fun when you know you can't die. 'Angus Sutherland', taking up where brother Kiefer left off in the original cult favorite, is the lead vampire in this modern reimagining of 'The Lost Boys'. The seaside village of Luna Bay is rife with outcasts and plagued by an outbreak of missing persons. As the sun sets, the Tribe rises: a group of adrenalin-fueled, thrill-crazed vampires tears up the surf and the streets with nonstop action. But when a champion surfer ('Tad Hilgenbrinck') and his sister ('Autumn Reeser') move in, dark secrets erupt into hot-blooded passions and full-blooded fear. Helping fight the forces of hell: 'Corey Feldman' in his signature role of vampire hunter Edgar Frog. Once you join the Tribe, there's no turning back. I have heard nothing but terrible things about this movie... but I loved the first one so much that I had to see this one for myself. So I went into this movie hoping to like it... but expecting to hate it.And maybe this attitude going into it is what helped me... because I enjoyed this movie. No... it is not nearly as good as the first one... but it is a decent vampire movie. I was worried when I bought this movie... but at least I am not sorry I got it. Sad to see that Corey Haim career crash that much, he was a good actor at the end of the eighties. The comment isn't about the other Corey that I've never appreciated, since I've seen him played the most annoying characters in the Friday the Thirtheen franchise. "It was an evil house from the beginning, a house that was born bad." The place is the 90-year-old mansion called Hill House. No one lives there. Or so it seems. But please do come in. 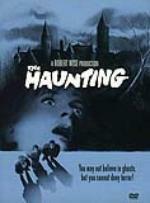 Because even if you don't believe in ghosts, there's no denying the terror of "The Haunting." Robert Wise returned to psychological horror for this much admired, first screen adaptation of Shirley Jackson's "The Haunting of Hill House." Four people come to the house to study its supernatural phenomena. Or has the house drawn at least one of them to it? The answer will unnerve you in this "elegantly sinister scare movie. It's good fun" (Pauline Kael, "5001 Nights at the Movies"). After watching... and enjoying the remake I thought it was about time to check out the original. I did enjoy this one... though for some reason I was expecting a little more from it. It is a good story... if not a little long. Especially considering how old the movie is. It seemed to move along a little slow for my taste... but not so slow that it bothered me much. It is good enough that I am glad I added it to my collection. I hardly dare ask... do you think it's better than its [hack spit!] remake?